Brittany Ferries have a reputation for providing a superior level of service and have several ferry routes on the Western Channel. Use the search box below to find excellent fares when booking Brittany Ferries. Brittany Ferries provide transport to Western France and Northern Spain, and offers all-inclusive tours. They have a wide range of self-drive holidays throughout France, Spain, and into Portugal. Brittany Ferries have the widest choice of routes and destinations. The time saved by using the fast ferry makes the actual holiday time longer or choosing an overnight luxury cruise makes a relaxed beginning to one’s holiday. Brittany Ferries depart from Portsmouth, Plymouth or Poole and offer fast crossings along with daytime and overnight comfortable cruises. Their destination ports in France are Cherbourg, St. Malo, Caen and Roscoff. Ferries sail daily on most routes with a variety of departure times to accommodate every holiday traveller. The most popular route is Portsmouth to Caen. 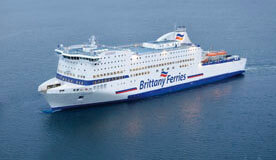 Brittany Ferries’ Mont St. Michel and Normandie cross the channel in 6-7 hours and have overnight options available. The Normandie Express provides a quick alternative, making the journey in only 3 ¾ hours. A variety of departure times are available, and cabins may be reserved for overnight sailings which allow for an early arrival in Caen, increasing time for holiday enjoyment. Weekend or day trips benefit from the fast-craft leaving early Friday, Saturday, or Sunday and docking at 11:30 am. Two ferries—the Bretagne and Pont-Aven—afford first rate accommodation onboard from Portsmouth to St. Malo and have excellent dining facilities. Evening sailings scheduled every day provide a pleasant journey overnight. Brittany Ferries’ Portsmouth to Cherbourg route is convenient for those desiring a fast trip to France. The Normandie Express arrives at Cherbourg in only 3 hours. Two departures take place daily including excellent onboard facilities and a comfortable lounge. The shortest crossing is from Poole to Cherbourg. The Barfleur cruises across the Channel in only 4 ½ hours. The Normandie Vitesse makes the trip quicker, taking just 2 ½ hours. Both ferries have comfortable cabins, excellent onboard facilities and day or overnight sailings with daily departure times. Un-crowded roadways connect with Paris, the Loire and the South of France. Brittany Ferries can help each traveller plan his route and suggest a range of accommodations for various budgets. Daytime sailings from Plymouth to Roscoff take 6 hours with overnight trips of 8 hours. Ferries leave twice daily on the Armorique and Pont-Aven. Both have restaurants, entertainment, shops and comfortable cabins onboard. The delightful destination fishing village of Roscoff has quayside restaurants, tourist attractions includinf botanical gardens, a Thalassotherapy Institute utilizing seawater for relaxation and healing, and other enjoyable picturesque sites. Two ports in Northern Spain are serviced by Brittany Ferries for holidays and touring to Madrid or Barcelona. Ferry routes from Portsmouth and Plymouth on the PontAven or Cap Finistère go to Santander, Spain and Portsmouth to Bilbao is the other route offered. Bilbao is located to ideally give access to both Northern Spain and Southern France. This provides a luxury cruise Bilbao starting a holiday in style. Twice weekly sailings depart on Friday and Sunday lasting 24 or 32 hours. The traveller can mix and match routes to suit his desired agenda. There are 5 return sailing per week making getting to Spain easy and saving a drive through France. Sunday departures leave at 2200 and make a two night crossing. The ferry makes a stop in Roscoff Monday morning and 1 1/’2 hours to load supplies and change crew arriving in Bilbao on Tuesday morning. Passengers may not disembark during the Roscoff stop.